Managed identity support for App Service on Linux and Web App for Containers is currently in preview. Managed identities for App Service and Azure Functions will not behave as expected if your app is migrated across subscriptions/tenants. The app will need to obtain a new identity, which can be done by disabling and re-enabling the feature. See Removing an identity below. Downstream resources will also need to have access policies updated to use the new identity. This topic shows you how to create a managed identity for App Service and Azure Functions applications and how to use it to access other resources. 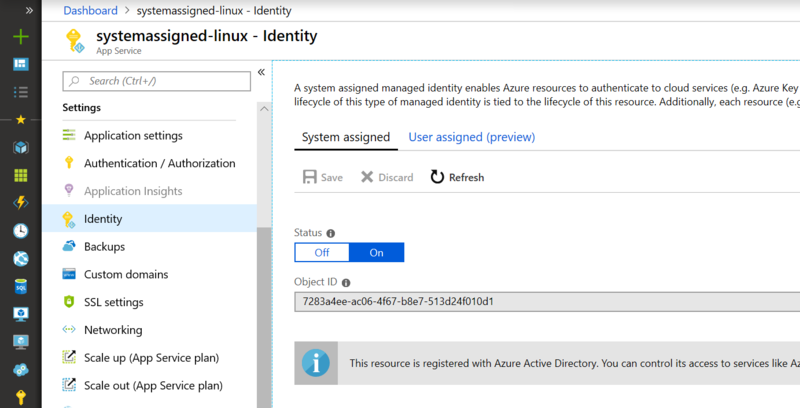 A managed identity from Azure Active Directory allows your app to easily access other AAD-protected resources such as Azure Key Vault. The identity is managed by the Azure platform and does not require you to provision or rotate any secrets. For more about managed identities in AAD, see Managed identities for Azure resources. A system-assigned identity is tied to your application and is deleted if your app is deleted. An app can only have one system-assigned identity. System-assigned identity support is generally available for Windows apps. A user-assigned identity is a standalone Azure resource which can be assigned to your app. An app can have multiple user-assigned identities. User-assigned identity support is in preview for all app types. Creating an app with a system-assigned identity requires an additional property to be set on the application. To set up a managed identity in the portal, you will first create an application as normal and then enable the feature. Create an app in the portal as you normally would. Navigate to it in the portal. If using a function app, navigate to Platform features. For other app types, scroll down to the Settings group in the left navigation. Within the System assigned tab, switch Status to On. Click Save. Use Azure Cloud Shell from the Azure portal. Use the embedded Azure Cloud Shell via the "Try It" button, located in the top right corner of each code block below. Install the latest version of Azure CLI (2.0.31 or later) if you prefer to use a local CLI console. If needed, install the Azure PowerShell using the instruction found in the Azure PowerShell guide, and then run Login-AzAccount to create a connection with Azure. An Azure Resource Manager template can be used to automate deployment of your Azure resources. To learn more about deploying to App Service and Functions, see Automating resource deployment in App Service and Automating resource deployment in Azure Functions. Adding the system-assigned type tells Azure to create and manage the identity for your application. Where <TENANTID> and <PRINCIPALID> are replaced with GUIDs. The tenantId property identifies what AAD tenant the identity belongs to. The principalId is a unique identifier for the application's new identity. Within AAD, the service principal has the same name that you gave to your App Service or Azure Functions instance. User-assigned identities are currently in preview. Sovereign clouds are not yet supported. Creating an app with a user-assigned identity requires that you create the identity and then add its resource identifier to your app config. This portal experience is being deployed and may not yet be available in all regions. First, you'll need to create a user-assigned identity resource. Create a user-assigned managed identity resource according to these instructions. Within the User assigned (preview) tab, click Add. Search for the identity you created earlier and select it. Click Add. Adding the user-assigned type and a cotells Azure to create and manage the identity for your application. Where <PRINCIPALID> and <CLIENTID> are replaced with GUIDs. The principalId is a unique identifier for the identity which is used for AAD administration. The clientId is a unique identifier for the application's new identity that is used for specifying which identity to use during runtime calls. An app can use its identity to get tokens to other resources protected by AAD, such as Azure Key Vault. These tokens represent the application accessing the resource, and not any specific user of the application. You may need to configure the target resource to allow access from your application. For example, if you request a token to Key Vault, you need to make sure you have added an access policy that includes your application's identity. Otherwise, your calls to Key Vault will be rejected, even if they include the token. To learn more about which resources support Azure Active Directory tokens, see Azure services that support Azure AD authentication. There is a simple REST protocol for obtaining a token in App Service and Azure Functions. For .NET applications, the Microsoft.Azure.Services.AppAuthentication library provides an abstraction over this protocol and supports a local development experience. For .NET applications and functions, the simplest way to work with a managed identity is through the Microsoft.Azure.Services.AppAuthentication package. This library will also allow you to test your code locally on your development machine, using your user account from Visual Studio, the Azure CLI, or Active Directory Integrated Authentication. For more on local development options with this library, see the Microsoft.Azure.Services.AppAuthentication reference. This section shows you how to get started with the library in your code. Add references to the Microsoft.Azure.Services.AppAuthentication and any other necessary NuGet packages to your application. The below example also uses Microsoft.Azure.KeyVault. To learn more about Microsoft.Azure.Services.AppAuthentication and the operations it exposes, see the Microsoft.Azure.Services.AppAuthentication reference and the App Service and KeyVault with MSI .NET sample. MSI_ENDPOINT - the URL to the local token service. MSI_SECRET - a header used to help mitigate server-side request forgery (SSRF) attacks. The value is rotated by the platform. resource Query The AAD resource URI of the resource for which a token should be obtained. This could be one of the Azure services that support Azure AD authentication or any other resource URI. api-version Query The version of the token API to be used. "2017-09-01" is currently the only version supported. secret Header The value of the MSI_SECRET environment variable. This header is used to help mitigate server-side request forgery (SSRF) attacks. clientid Query (Optional) The ID of the user-assigned identity to be used. If omitted, the system-assigned identity is used. access_token The requested access token. The calling web service can use this token to authenticate to the receiving web service. resource The App ID URI of the receiving web service. This response is the same as the response for the AAD service-to-service access token request. Environment variables are set up when the process first starts, so after enabling a managed identity for your application, you may need to restart your application, or redeploy its code, before MSI_ENDPOINT and MSI_SECRET are available to your code. For .NET languages, you can also use Microsoft.Azure.Services.AppAuthentication instead of crafting this request yourself. Removing a system-assigned identity in this way will also delete it from AAD. System-assigned identities are also automatically removed from AAD when the app resource is deleted. There is also an application setting that can be set, WEBSITE_DISABLE_MSI, which just disables the local token service. However, it leaves the identity in place, and tooling will still show the managed identity as "on" or "enabled." As a result, use of this setting is not recommended.